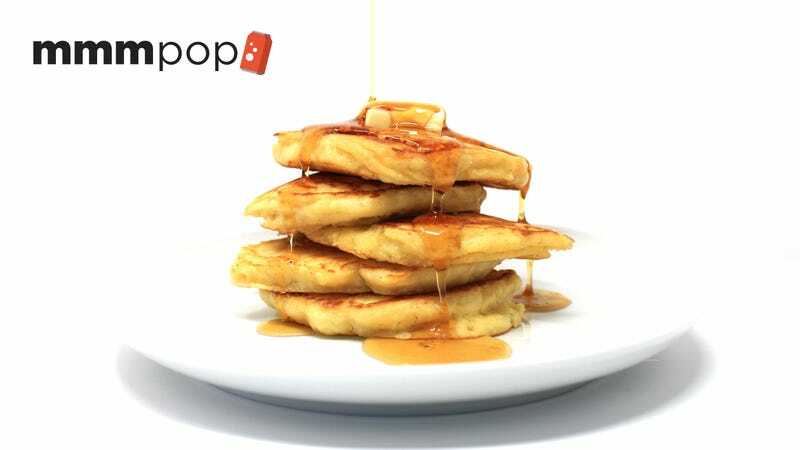 Welcome to MmmPop, our exploration of unexpected ways to use soda pop in recipes. I was never what you’d call a breakfast traditionalist. Sweets for breakfast, even to kickstart the day with a hit of sugar, never quite tasted right. I was the only kid in class who didn’t enjoy cereal, pancakes, or waffles. My philosophy was that breakfast should be savory, and preferably use animal ingredients: bacon, sausage, eggs. Also, and this is no joke, my LDL cholesterol at age 10 was a horrifying 250. I’ve since cut back on the cured meats, I thank God for statins, and I’ve come around on pancakes and waffles, mostly because I enjoy making them for my 18-month-old kid. My wife and I avoid the prepackaged pancake mix, as it’s rather easy and satisfying to make pancakes from scratch. But rather than using buttermilk, our household opts for using a liquid that was popular for pancakes in the 1950s: lemon-lime soda, which adds a cupcake quality to the pancake flavor. Start to finish, these take 15 minutes to make. In a large bowl, whisk together the flour, sugar, baking powder, and salt (optional for fancy folks: add the zest of one lime). In a separate, smaller bowl, beat one egg then mix in the oil and soda. Fold the liquid ingredients into the dry ingredients to create a smooth, thick batter, making sure not to over-mix. Add a tablespoon of butter to a wide skillet over medium heat. Spoon 1/4 cup of pancake batter into the hot pan for each pancake. Once tiny bubbles form on their surface, after a minute or so, check the underside with a spatula. Once it’s golden brown, flip it in one swift motion. Cook until the other side is golden brown as well, then serve immediately with butter and maple syrup.